This month sees the launch of London’s most anticipated design suite at Hilton London Bankside. 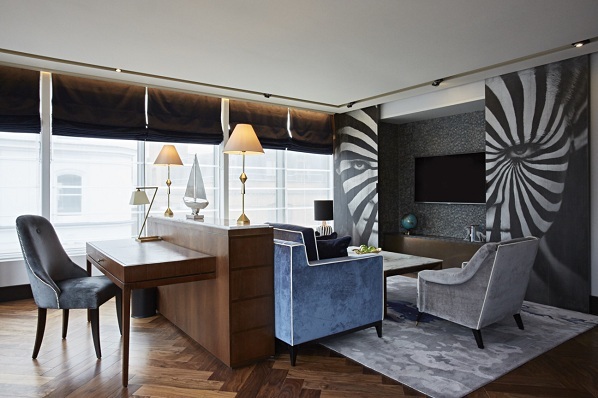 Created in partnership with London-based architect and interior designer Dexter Moren Associates and interior design practice twenty2degrees, the cutting-edge Penthouse Suite is a stylish finishing touch to the hotel which opened in October last year. Reflecting the fascinating history of Bankside and echoing the urban character of the area, the Penthouse, which has the look and feel of an elegant and spacious city apartment, is filled with contemporary art and has views overlooking the Tate Modern and The Shard. 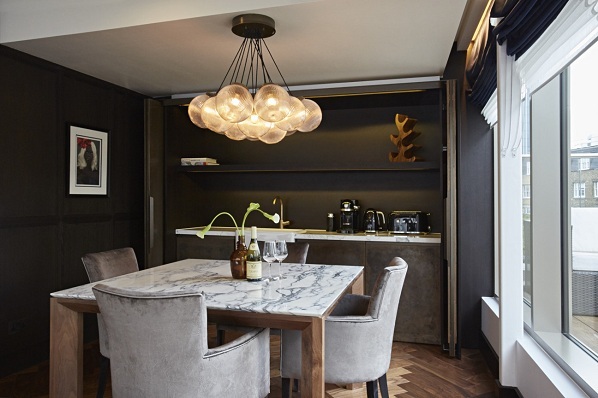 Spacious, light and elegant, the one-bedroom Penthouse suite is filled with bespoke furnishings, one-of-a-kind art work and dark oak Parquet floors. The suite includes a large living area complete with a comfortable sofa and chairs, upholstered in blue and grey velvet respectively, giving the room a truly elegant finish. Filled with natural light, due to the floor-to-ceiling windows that cover over half the room, the suite is the perfect place to relax, or for those wanting to work, a dark wooden desk faces the middle of the room. The central focus of the living area is the large statement black and white photograph by Alexander Khokhlov which covers the interior wall of the suite. Acting as a screen to cover the television, the image not only connects the hotel with the nearby Tate Modern, but also references Hilton London Bankside as a living art gallery. The individual art collection in the Penthouse, and the rest of the hotel, was curated by Peter Millard and Partners who sought to complement the industrial and urban theme of the property as well as the polished contemporary design of the suite. The kitchen and dining area is perfect for those staying for longer durations who want to dine in the comfort of their suite. 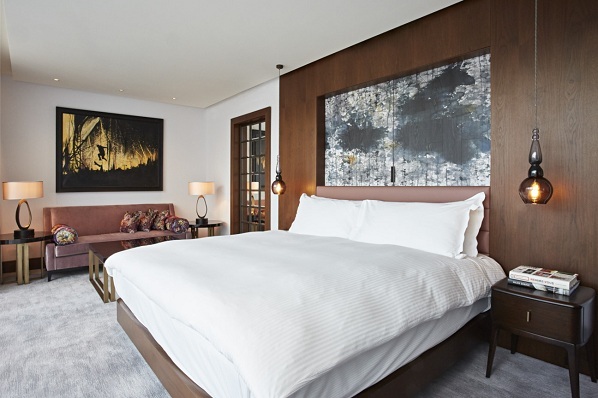 The bedroom, with stunning views overlooking The Shard, has its own distinct style with copper coloured soft furnishings and Designers Guild fabric used on the cushions dotted around the room. With a gentle nod to Hilton London Bankside’s passion for art and design, the television in the bedroom stands on an easel. The bed, flanked by hanging decorative lights by Curiousa & Couriosa, faces another floor-to-ceiling window which maximises on the natural light. The pièce de résistance of the Penthouse is the expansive 30m2 private roof terrace which looks over the Tate Modern and the hotel’s very own roof top Meadow. When Hilton London Bankside was originally being built the hotel focused on integrating green areas in and around the hotel as another way of helping regenerate Bankside. The Meadow is the perfect example of this, full to burst with wild flowers and plants and even its very own bee hives, helping attract wildlife to the neighbourhood. The opening of Hilton London Bankside in October last year marked Bankside as a true destination for business, tourism and culture.